In your journey of evolution, there is not one turning point that makes all the difference. You do not need to worry about making a wrong turn or a wrong decision that would somehow thwart your progress. The journey that you are on is not about finding the right way, or the right thing to do, not at any moment, and not as a long and drawn out path. All that really matters is that you show up. When you show up for your life, you give yourselves the opportunity for experience. And experience is what the Oversoul craves. So from the Oversoul’s perspective, there’s nothing you could ever do to screw up on your journey. There is no point of no return, and there is no such thing as a mistake. When you recognize that at the heart of your journey is you as the experiencer, then you are less likely to measure yourselves or to count your worthiness by how many good deeds you did, how much you avoided temptation, or how often you meditated. You get to be the one at the heart and soul of your journey. And as you are that being, the one having the experiences, you get to decide in every moment which version of yourself you want to be. And that is not dependent upon anything that you have or have not done, said, or experienced up until the point of decision. You get to decide, not your past, not your past lives, not even your Oversoul. And every decision that you make is perfect, just like you. Taking the energies into consideration, you are all doing very well. It is no small task to ascend. It is not something that comes with an instruction manual either. You are learning as you go. You are gathering information from various resources, such as ourselves. And many of you are still dealing with day-to-day concerns of living on planet Earth, while you make this gigantic leap in frequency. So no matter how your life looks at this time, you can rest assured that you are making progress, you are right where you need to be, and the next resource that will assist you is already on its way. Having said all of that, we also want to convince you that it is worth it. What you are doing by shifting to the fifth dimension is serving not only yourselves. You are not just making this shift for your own personal benefit. You are assisting all of your other incarnations. You are assisting your brothers and sisters all across this universe. You are beginning to grasp the enormity of this endeavor. And we are not going to stop congratulating you on every step of this journey, because our job is to support you. Our job is to energetically encourage you, and we also get to observe like proud parents as we watch you learn, expand, and grow. Put your awareness on the distance that you have already traveled in this one lifetime, and let all of your accomplishments sink in. There is so much more to come, but there is always time to celebrate. (Note: these messages were given during our 1st Sunday of the month Ancient Awakenings joint call with Hollow Earth Network over Blog Talk Radio in Glendale, AZ on July 3, 2016). Also note that only the main messages are included here. If you wish, you can listen to the question/answer portion by going to our website or the HEN website and listen to the audio files. Wonderful to be with you again in this way, to be able to share in these messages and to be able to spread the word in every way we can. Please understand that throughout this planet, many are receiving these messages and to the various groups who resonate to the words that come through. Those of you who are on the phones now and those who will listen after, you are the ones we are reaching to. We are reaching out to you so that you can reach out to others. This is all about spreading the word, spreading the light, spreading the love wherever we can. And we use every means possible to do this. And this, at this time, is a way that you, yourselves, can participate in this. Many of you say, “What can I do?” The answer to that is that you can do tremendous things. You can make a difference. You are making a difference. It only takes one individual consciousness to change an entire world. All of you coming together are changing this world, are changing this planet. The planet is spreading with waves of love. The Waves you have heard of, the various consciousness waves are spreading across the planet. The third Wave has come through and spread across the planet now. Not everyone has reacted exactly as you might have expected. Not even you have experienced a great degree of change but we also know that many of you have. Fourth of July that has come forward as far as this country goes. Many messages have come forward about this particular time period of 2016. But this particular summer period of 2016 is going to be a momentous time. These changes, the various dominoes, have already begun. You have just to look around yourself to see the various things that have changed as a result of these energies. The consciousness is shifting. Everything is about to move forward further. The various dominoes that you are expecting may not have happened yet but a very big domino did fall, that called the exit of Great Britain from the European Union. This is a major domino that has shifted, has fallen. Many things will happen as a result of this. Many other countries are going to follow suit along with Great Britain. The Dark Forces, the cabal are at their last dying gasp you might say. Everything is shifting because of these ones that are considered the Dark Forces. When we look at them we do not see Dark Forces or dark entities or dark souls. We see souls of the light. They have just lost their way for a time. They will come back as all come back eventually. We leave no one behind. That is the saying on this planet and for us as well. We leave no one behind. So, as we continue on through the various energy waves and challenges that are happening you are getting ready for the missions you came for. Some of you are already involved in those missions. Some of you have not yet begun but I tell you now that the tables are waiting for you. The various council tables are waiting for you if you choose to be on them. As well as many other possibilities that you can become involved with. Much is available to you. Let your Higher Self guide you to what it needs. That is my message as “Sananda”. You are going to be joined by another who has a particular timely message for you at this moment. I am “Sananda”. All of my peace and love be with you. And I am “Archangel Michael”. I have not spoken through this one, only a couple of times previously, because previously the energies did not quite match here and I was only able to be through this one a brief moment. But the waves of energy have changed much. So everything is shifting, as “Sananda” has said. I have come here at this time, and I will be coming through many different channels, as the frequency continues to rise across the planet. I am the one who holds the key. I hold the final seal and have guarded this seal. It is time now for the final seal to open. And for all of the energies to come forward and for all of mankind to move into your Golden Age that is fast upon you now. So many things are in flux. So many things are happening across the planet. Some that you can see and some you cannot yet see. Not with you physical eyes but with your single eye, you can see much. So know that. You are in the process now of awakening that single eye, that Third Eye center, your Pineal Gland. Many are coming to this awakening and once this single eye opens it will never close again. You will never be in darkness again as this planet has been in much of this time. Many of you have been held back in this darkness not to see through this Third Eye center as you could do previously. Many of you have been darkened by using your own physical eyes. You are held back from what is behind the veil. For those of you who have opened this Third Eye or are in process of doing so, you are seeing through the veil. We are hearing many experiences now. Do not worry about how or where it was put up, just that it is coming down now. It is coming down for all across the planet that are ready for this. Not for everyone at once because that would cause tumultuousness, too much conflict across the planet. As frequencies rise this veil of secrecy, this veil of consciousness is coming down and you will notice many things that you have not been aware of before. As everyone is saying there are changes happening everywhere, again many of you are not aware of because they are happening behind the scenes. But I tell you now, as “Archangel Michael”, those covert times of not being able to see what is going on or not being able to understand the truth about what is happening is about to end. Fully about to end. There are announcements coming from your various leaders and others you are not even aware of yet. There are whistleblowers coming out of the woodwork you might say. They will be announcing many things and sharing many things that have been going on. This will awaken the public to what is going on under your noses. These things have been happening in plain sight but have been hidden from you because of the veil. As I have said the veil is dropping and it will be gone shortly. All of these things that you have been hearing about are truly to begin. This 4th of July is special. I am not saying that tomorrow will have a different form of fireworks although that is possible. There are so many things that are going to happen in this month, the next and the one after that you will have a sense of a whirlwind about you from all that is happening. For all of you who say that nothing is happening, be patient just a little bit longer because your patience is going to be rewarded very soon. You are the ones who are creating this entire process. Those of you who are the Lightworkers, the Light Warriors, the ones who share the Light…you are creating this entire process now so that it can spread to all across the planet. And when I say all, I mean all. Not a small percentage but all across the planet will have this consciousness shift. That does not mean they will all ascend at once. Many of you are in the Ascension Process now. Many have already ascended and are not aware of it. Many have ascended and come back with conscious awareness. There are so many different situations and various aspects that are going on. You are now in the very beginnings of this. As “Sananda” has said, you are crossing the finish line. Even now as I speak, you are crossing the finish line. Some of you are ready to go back to help others who are straggling behind. Others are ready to move ahead to other endeavors that may be off world, beyond this world. Many of you are preparing yourselves to be of assistance to assist just so that we are not working alone with man’s consciousness to bring these new changes to the forefront. To bring about this new Golden Age of Mankind. The time is NOW my beloved brothers and sisters and you are in this very moment. I am ”Archangel Michael” and I love you. Call on me and I will bring my blue sword of truth and severe the last of psychic ties that may be holding you back in this 3D world of illusion. The time is now. Peace and love be with all of you. 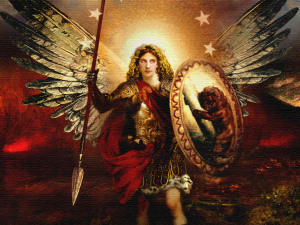 I am “Archangel Michael”. Well, that was a wonderful surprise, was it not? We knew that this would be a wonderful day with many good speakers. And I come to tell you today that we, from the Hollow Earth area, Telos and Shambala and all other regions, we are now coming to the surface to share with you. You can see us in cafes; you can see us in stores and in other parts of your day to day life. Those of us who are here as your mentors will be making contact in a very short period of time. You are free! Freedom has taken its place and even if you cannot fully see it, it is here. We are so proud of the opportunity of coming on the surface with you to share with you and to care with you. We know this is an important time for all beings. Those of you who meet us will also soon meet your Galactic Brothers and Sisters. All of these things you soon shall be able to see. So, be patient a little longer. Know that those things hidden behind the screen from your eyes have already been accomplished in the higher frequency. They are there for you to enjoy as you continue on your journey of rising frequencies as well. These are times to be happy. Times to be at peace. These are times to be in bliss. We know that there are times of challenges but let that moment go by. Move through it to a greater happiness and greater bliss than you have ever known. Freedom is yours my friends. Freedom is now. We are glad to stand with you and all move forward in this great journey. I let it be so, today. Greetings to all. We are here to serve which we certainly do in this question and answer process but before we do we wish to share a short message. You are here in this moment and you have been preparing for a very long time for this frequency change that is happening. And as has been said by “Sananda”, “Archangel Michael”, “Adama” and “St. Germain” you are the ones who are creating all of this. You do not need to run a website or be on the radio such as this. You only need to share your smile, your expression wherever you can. In this way there is nothing that can hold back this consciousness wave that is sweeping across the planet now. Be of good cheer people. For the Fourth of July for people in this country this is a special time. For those in other parts of the world, this is a special time for you. It is not the fireworks and all that. It is the fireworks that are happening across the planet within your Kundalini Energy that is rising. Think of this as the fireworks now. As the energy moves up through your energy centers and enters your Third Eye Center, your Pineal Gland, as it moves into your Crown Chakra, your seventh chakra, you have a bursting of fireworks. This is what is meant here. It is not the fireworks displays of the Fourth of July but the fireworks within. It is always so within and so without. We had a bit of a calamity down here when James dogs, the Huskies, came down. We watched and even though there was some upset everything was fine. The dogs wanted to join the energy. All of nature, the animals, the trees feel this great energy. The trees themselves don’t want to worry about being cut down anymore, their numbers limited. You have family and they have family too. Mankind does not think about that. It has a family. It has a soul. It has energy going through it, consciousness. The more you can react or respond to that consciousness the more you will rise in your vibration. As you raise in vibration, everything around you raises in vibration. The more you raise, the more the world raises and that is how it is going to continue on and on and on. So, sit back and prepare for the show. We literally mean that. Freedom is coming for the entire world so just sit back and enjoy the show. We so enjoy the show with you. OK? Wow! Most definitely worth your time to listen. Goosebumps!!!!!!! Release Yourself – Plunge into the Ocean of Light! Your world is about to change in a profound way over the next two months as a powerful wave of gamma light coming from the Galactic Core, (The Pleroma) impacts Earth and its beings! It’s important to note that we are already well inside this cosmic gamma blast referred to as WAVE-X and many of you have been feeling this energetic increase that will continue in intensity everyday until September 28th, 2015.